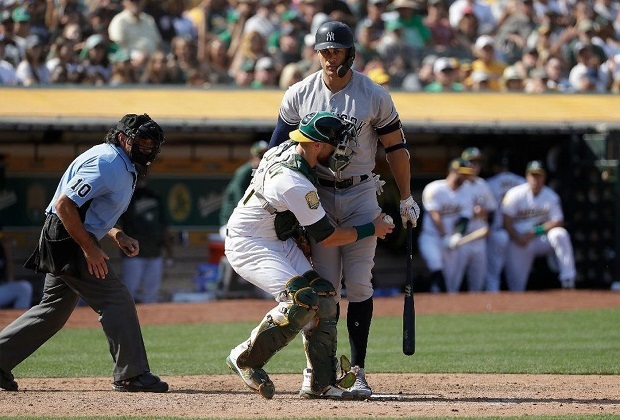 The Yankees nine-game, 10-day road trip got off to a miserable start in Oakland with a 6-3 loss on Monday afternoon. The three runs masked a lackluster offensive showing, as they were 0-for-5 with runners in scoring position and managed just four hits while striking out 11 times. The last time the Yankees had four or fewer hits and struck out 11 or more times in a game against the A’s … World War II was still more than one month away from officially ending — July 27, 1945. CC Sabathia had one of his worst outings of the season, lasting just 3 1/3 innings while getting tagged for five runs (four earned) on seven hits and lots of loud contact. Six of the 13 balls in play against him were line drives, a season-high rate of 46.2 percent. The Bay Area native now owns a 5.38 career ERA in 11 starts at Oakland Coliseum, his second-highest mark at any stadium where he’s made more than five starts (5.68 at Rangers Ballpark is his worst). 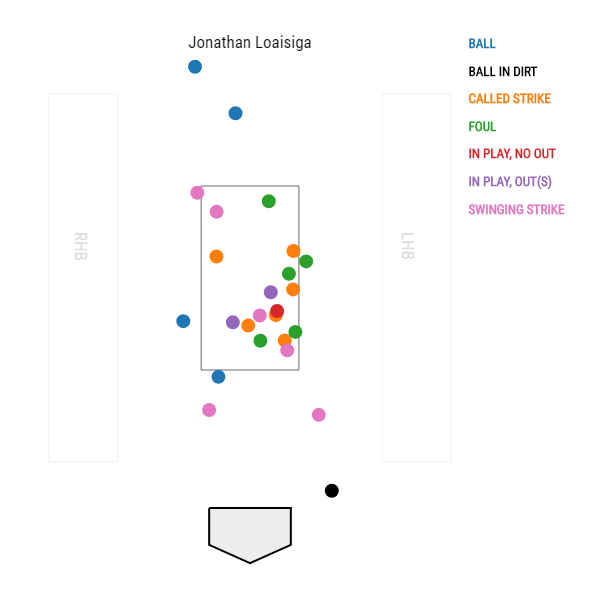 The most impressive Yankee pitching performance was turned in by Jonathan Loaisiga, who threw two scoreless innings with four strikeouts — each of them swinging — and one hit allowed. He was excellent in pounding the outer edges of the zone against righties with his fastball-slider combo, netting six whiffs and six called strikes on 25 pitches. Torres is one of five players in AL history age 21 or younger with at least 20 homers, a .350 on-base percentage and a .500 slugging percentage through their first 100 career games. The others: Jose Canseco, Tony Conigliaro, Joe DiMaggio and Hal Trosky. Fun list, eh? Thanks to #toomanyhomers, the Yankees overcame another bout of early-inning dead-bats disease and rallied for a 5-1 win on Tuesday night, snapping their five-game losing streak in Oakland. After getting no-hit through 5 2/3 innings, the offense exploded for seven hits and five runs in the final three innings en route to what turned into an easy victory. This type of late-inning rally has become commonplace for the Yankees, who improved to an impressive 12-6 when tied at the start of the eighth inning. Last year they were 5-7 in those games, and the 12 wins are their most in a season since going 15-0(!) in 2009. The Yankees tied the game at 1-1 in the seventh after an Aaron Hicks bases-loaded walk — his AL-leading fourth bases-loaded walk of the season — and then pulled ahead in the next frame when Luke Voit led off the eighth with a solo home run. It was Voit’s seventh longball with the Yankees, and fifth that either tied the game or gave the team a lead. Obscure Yankeemetric Alert! The last Yankee with a go-ahead homer in the eighth inning or later in Oakland was Jason Giambi on April 14, 2007, a solo shot in the top of the 13th that propelled the Yankees to a 4-3 comeback win. J.A. Happ bounced back from his worst start as a Yankee to deliver one of his best starts as a Yankee. He made one mistake in his gem (a solo homer in the second inning), but otherwise turned in a masterful six-inning, two-hit, one-run performance. In two outings against the best teams he’s faced as a Yankee — Tuesday vs the A’s and August 14 vs the Rays — he’s pitched a combined 13 innings, faced 45 batters, allowed three hits and just one run in those games. The Yankees visit to the Bay Area ended with an disaster-filled dud, getting manhandled by the A’s 8-2 on Wednesday night. The Oakland Coliseum has become of house of horrors for the Bombers recently. They are now 7-18 (.280) at the stadium since the 2012 All-Star break, their worst win percentage at any AL ballpark over the last six and a half seasons, and the second-worst win percentage by any AL team there in that span (Twins are 4-16). 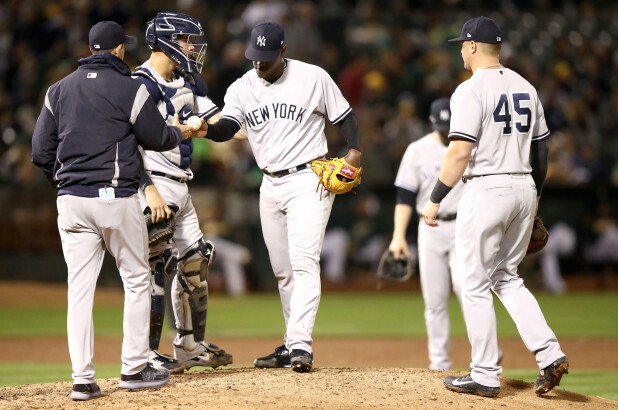 Pitching against the team that the Yankees are most likely to face in the Wild Card Game, Luis Severino had his worst start of the season, a total disaster in which he lasted just 2 2/3 innings and was blasted for six runs on six hits. The A’s rocked Severino from the start, as four of the first five batters pounded him with three scorched doubles and a line-drive single, plating four runs before Severino even recorded the second out of the first inning. Those hits weren’t cheapies, either, they had exit velocities of 109.6, 106.3, 103.1 and 103.8 mph. Before Wednesday, he’d never allowed more than two 103-plus-mph hits in any single inning in his career. His lack of command was startling as Severino not only served up multiple meatball pitches but also threw two wild pitches and Gary Sanchez was charged with two passed balls. Sanchez has allowed 29 passed balls over the last two seasons, the most of any catcher in MLB in that span. This game was an absolute debacle, yes, but it did produce a notable Milestone Alert. When Severino struck out Stephen Piscotty for the second out, it was his 200th strikeout of the season, the second straight season he’s reached that mark. Two other pitchers in franchise history have recorded multiple 200-K seasons, but none have done it three times. Also, the 24-year-old became one of seven pitchers in the last four decades to record back-to-back 200-strikeout seasons before the age of 25. The others: Clayton Kershaw (2010-12), Yovani Gallardo (2009-10), Felix Hernandez (2009-10), Roger Clemens (1986-87), Fernando Valenzuela (1984-85) and Dwight Gooden (1984-86).